▪ The NFL’s J.J. Watt, a defensive end for the Houston Texans, has led the way on celebrity fundraising for the Hurricane Harvey relief effort—setting up a fundraising campaign that has collected at least $18 million. Watt pledged $100,000 of his own money and set an initial goal of $200,000. Sandra Bullock and Ellen DeGeneres each donated $1 million. ▪ The average age of fathers of newborns rose from 27.4 years old in 1972 to 30.9 years in 2015, a new Stanford University study found. The percentage of newborns’ fathers who are over 40 rose to 8.9 percent. ▪ About 70 percent of the multibillion-dollar home damage costs caused by Hurricane Harvey won’t be covered by insurance, according to property analytics firm CoreLogic. 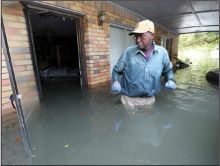 Most of the damaged homes in southeast Texas and southwest Louisiana lie in areas not covered by the National Flood Insurance Program, while most standard homeowner insurance policies do not cover damage from rain or floodwaters. ▪ North Korea is the only country to perform a nuclear test in the 21st century, detonating six such devices in the past 11 years. The U.S. has carried out 1,032 nuclear tests in its history—including 96 in the single year of 1962— but hasn’t tested a device since 1992.